There are two main manufacturers for good quality pools slides: S R Smith and Interfab. These two companies make slides of different sizes and different lengths. But if you’ve got the deck space and a big pool, the large inground pool slides may just be the perfect one for you. The slides listed below all need a minimum of 11 feet x 4 inches with the biggest inground pool slide requiring a deck space of 14′ 6″ x 8′ 0″. The S R Smith pool slides for inground pools tend to be more expensive than Interfab. These slides have all passed the Consumer Product Safety commission and are made to be compatible with salt water pools too. This swimming pool slide requires the biggest deck space which is 13’6″ x 6’7″. The water chute/flume from one end to the other measures 14′ 4″ long so It’s not the longest on this list. The Turbo twister is one of the most in demand slides from SR Smith. 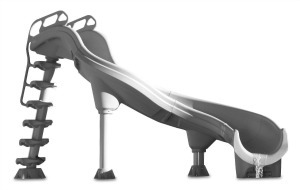 With a maximum weight capacity of 275 pounds, the slide has curves and dips that are sure going to bring a lot of fun for the whole family. If you want a landscape slide, the Big Ride is the perfect fit. It’s not very high at 5′ 6″ but the flume is pretty long at at 17′. Also, it is deep and a cascade of water flows through it making it look more like a waterfall in your backyard. Available in Pewter gray and Taupe, it easily blends in too. 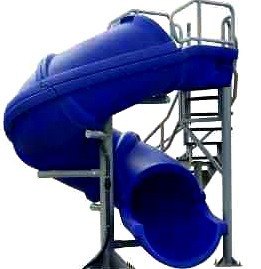 The Typhoon Slide has the same features as the Turbo Twister and can carry just as much weight. The flume also has exciting curves and deeps too. However, this needs smaller space at only 11’8″ x 4′. 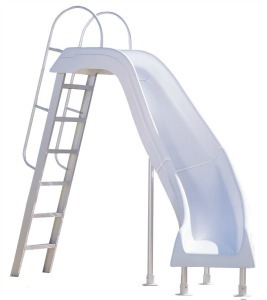 Interfab pool slides tend to be cheaper but they are just as good and highly rated. They have some pretty unique designs too. Like Sr Smith slides, these are salt pool water safe and pass CPSC safety requirements. Of all the Interfab pool slide, the X Stream 2 is the one that needs the most space. The recommended deck area is 14′ 0″ x 8′ 6″. It stands 6 feet high. The runway is deep and the stairs looks very unique. It holds a maximum weight capacity of 250 pounds. The Adrenaline slide is the second large pool slide for in ground pools from Interfab. It requires a 14′ x 8′ 6″ space and holds as much as 300 lbs. 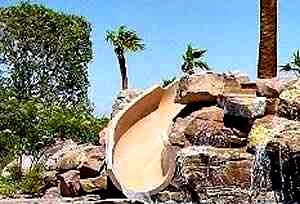 It’s available in only 1 color and has water park like water flow. The slide twists in two turns which many users love. This is a great pool accessory for would look good in your ultimate outdoor living. 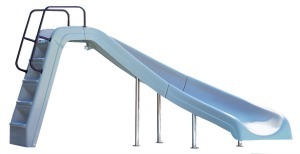 Here’s a popular Interfab product, the Wild Ride Slide. It needs 12′ x 5′ deck space with four different colors to choose from. 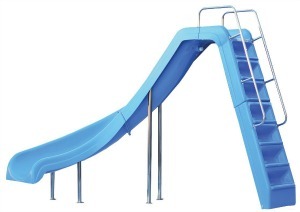 It’s a simple looking slide that is 6.5′ high. This needs about the same space as the Wild ride slide above, except that this one is shorter at only 4′ high. It’s made of acrylic and with a weight limit of 250 lbs. This also needs 12′ x 5′ space for assembly but is higher than the White Water at 6′ high. However, it can accommodate only a maximum of 225 lbs. 9 feet long Flume and is good value for money. That’s all for the large inground pool slides. If you want to see some smaller sides, check out this list of pool slides inground pools for small yards.